Bibliothèque nationale de France, MS Latin 7980, detail of fol. 5v. What is a gloss? The term appears with relative ubiquity in scholarship but there is little consensus on what constitutes a gloss. Is a gloss simply a string of text that appears beyond the borders of what modern readers consider the primary text? The primary concern when defining such a term is the beginning. But where do we begin? Can we simply examine historical usage as the foundation, or should we look at the etymological roots of the term? Alternatively we can examine how scholars have labelled glosses functionally; that is, can we categorize glosses based on what value they add to a text? Another avenue of exploration still is the spatial dimensions of glosses: where do they appear on the page? To define such a ubiquitous term, we more likely need to examine all of these dimensions and explore their relations to each other. Recently, Kathryn Kerby-Fulton has commented that the study of annotations in relation to medieval reading theories is in its “infancy” (213). Moreover, the “contribution of marginal notation to our understanding of how readers actually used the page” is even less studied (213). 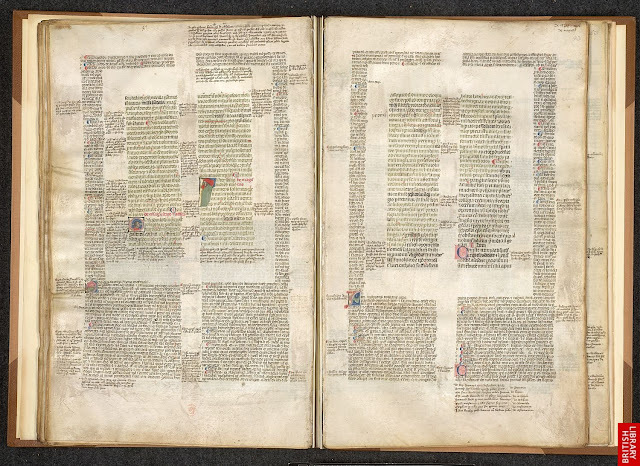 The disconnect between the ubiquity of marginal notation, specifically, and manuscript notations, generally, and the scholarship on such notations is surprising, given the important role that these types of textual apparatus played in medieval reading practices. While Kerby-Fulton deals explicitly with individual symbols used to mark up the text, she addresses the equally understudied subject of glosses. Throughout this case study, I will suggest that the gloss is another form of notation, and though distinct, serves a fundamentally similar purpose. That is, gloss is an umbrella term which covers annotations, translations, summaries, and commentaries, amongst others in a potentially inexhaustible list of possibilities. The study of glosses is only a subset of medieval reading theory, but is also intimately linked to manuscript production. 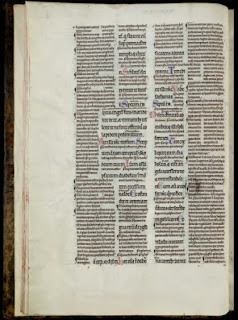 By better understanding what glosses are and how they function, scholars can better approach manuscripts which contain them, leading to a more comprehensive understanding of medieval reading practices and in turn a more insightful interpretation (see Wiebe on Chaucer, here and here). 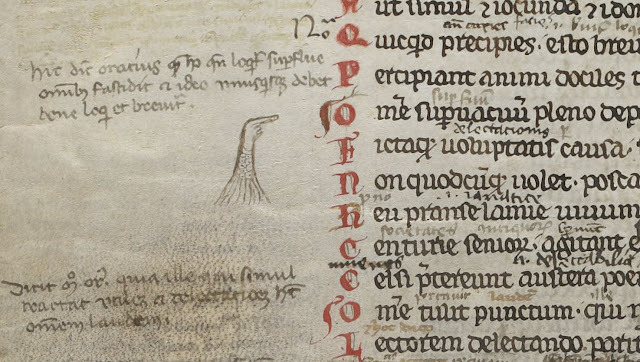 Our exploration and pursuit of a taxonomy of glosses will cover a series of blog posts. (1) First, I will look at the etymological roots (routes) of the term as it enters the English vocabulary; (2) second, I will explore historical examples of glosses throughout the early and high Middle Ages; (3) third, I will advance to the practical codicological dimensions of spatiality and point of introduction to the text; and (4) finally examine the function of glosses; that is, how they interact with the primary text. Cambridge, Trinity College MS B.5.5, fol. 9v. The OED’s definitions largely avoid a circular relationship between a set of terms which are very often defined with reference to each other, but have slight differences: translation, annotation, commentary, and paraphrase. That is, these terms represent methods of presenting additional information about the meaning of the main text; the difference can be found in the scope, intention, and even length of the gloss. These terms will appear throughout this case study, since they are often used interchangeably by modern scholars, albeit problematically. Navigating the vocabulary can be frustrating since it can be difficult to determine how the term gloss is being used. I will address functional differences between glosses in a later blog post, but for now, consider the implications of confusing a marginal annotation referencing an older text written in by a glossator at the time of production and an interlinear translation copied in by a reader a century later. If we simply label both of these secondary texts as glosses, we learn nothing about what is occurring: there is no information revealed about the function of the gloss, the spatiality of the gloss, the relationship of the gloss to the main text, or whether the gloss was produced idiosyncratically or appears as a part of a larger system of glosses in the same manuscript. While it may seem simpler just to label textual apparatus as glosses, I suggest that by overusing the term gloss, we lose valuable information that can inform the reader. Therefore, by narrowing the definition of gloss, even by simply acknowledging that gloss is used as an umbrella term, we can be more cognizant of what we are reading and writing; that is, we can start to ask questions such as "How does this gloss inform my understanding of the text? What can I expect from an interlinear gloss?" In my next blog post, I will explore the historical uses of glosses, including their contexts within a larger tradition of glossing. Kerby-Fulton, Kathryn, Maidie Hilmo, and Linda Olson. 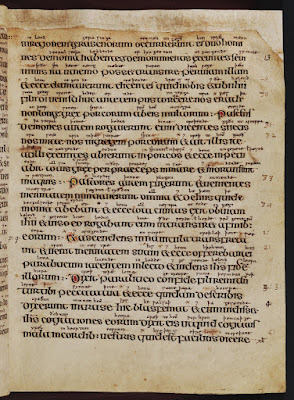 Opening Up Middle English Manuscripts. Ithaca: Cornell UP, 2012.